The Prince of Wales has officially opened a purpose-built “home away from home” for the families of wounded troops being treated in hospital. His Royal Highness met wounded service personnel and their families before cutting a ribbon and unveiling a plaque to mark the opening of the Help for Heroes-backed Fisher House at Birmingham’s Queen Elizabeth Hospital. The facility, thought to be the first UK-US military charity partnership, will provide long-term support to the loved ones of servicemen and women with life-changing injuries. 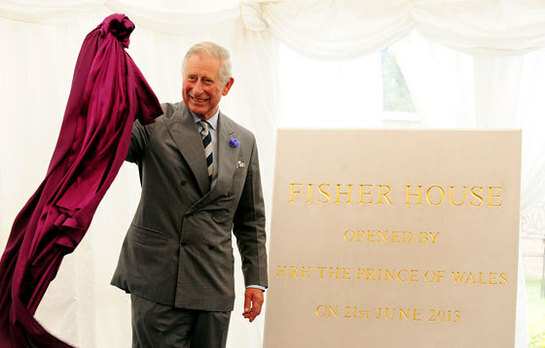 The Queen Elizabeth Hospital Birmingham Charity, Help for Heroes and American charity Fisher House Foundation have formed a partnership to create the 18-bedroom home. A five-minute walk from the wards where military patients injured overseas are treated, the new accommodation will be made available to their families at no charge. Offering spacious bedrooms, kitchen facilities, living rooms and a garden, the new £4.2 million building is designed to allow military families to share their experiences and support each other. The Prince of Wales, who has made numerous private visits to injured troops at the hospital in recent years, also chatted with staff who will help to run the newly opened home, which is modelled on a network of similar facilities in the United States. Earlier, The Prince visited Solihull in the West Midlands in his role as patron of Marie Curie Cancer Care. The Prince was joined by girl group The Saturdays as he officially opened a new £20 million Marie Curie Hospice. Building work at the site in Marsh Lane began two years ago and The Saturdays have supported the project since its inception. His Royal Highness visited the hospice’s day service centre with the pop stars and met in-patients privately before also meeting volunteer gardeners and staff. Commenting after the visit, Marie Curie chief executive Dr Jane Collins said: "We are honoured that His Royal Highness The Prince of Wales and The Saturdays were able to attend today and open our new hospice and meet our staff, volunteers and patients. The Saturdays member Rochelle Humes, making her first public appearance since giving birth to a baby girl in May, said: "It is such an honour to be part of such a special day and amazing to see how fantastic the hospice looks.